Where do you need to be blessed? Where should you be a blessing to others? A ruler came and knelt before Jesus and said, “My daughter has just died. But come and put your hand on her, and she will live.” Jesus got up and went with the ruler, and so did Jesus’ disciples. Just then a woman who had been subject to bleeding for twelve years came up behind Jesus and touched the edge of his cloak. 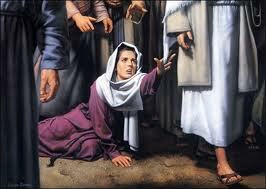 She said to herself, “If I only touch Jesus’ cloak, I will be healed.” Jesus turned and saw her. “Take heart, daughter,” he said, “your faith has healed you.” And the woman was healed from that moment. When Jesus entered the ruler’s house and saw the flute players and the noisy crowd, Jesus said, “Go away. The girl is not dead but asleep.” But they laughed at Jesus. After the crowd had been put outside, he went in and took the girl by the hand, and she got up. News of this healing spread through all that region. Where have you felt the healing touch of Jesus? Who around you needs Jesus’ healing touch? It was just before the Passover Feast. Jesus knew that the time had come for him to leave this world and go to the Father. Having loved his own who were in the world, Jesus now showed them the full extent of his love. The evening meal was being served . . . Jesus knew that the Father had put all things under his power, and that he had come from God and was returning to God; so Jeus got up from the meal, took off his outer clothing, and wrapped a towel around his waist. After that, Jesus poured water into a basin and began to wash his disciples’ feet, drying them with the towel that was wrapped around him. Jesus came to Simon Peter, who said to him, “Lord, are you going to wash my feet?” Jesus replied, “You do not realize now what I am doing, but later you will understand.” “No,” said Peter, “you shall never wash my feet.” Jesus answered, “Unless I wash you, you have no part with me.” . . . When Jesus had finished washing their feet, he put on his clothes and returned to his place. “Do you understand what I have done for you?” he asked the disciples. “You call me ‘Teacher’ and ‘Lord,’ and rightly so, for that is what I am. Now that I, your Lord and Teacher, have washed your feet, you also should wash one another’s feet. I have set you an example that you should do as I have done for you. Have you ever been served by God? 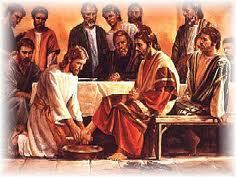 Who has washed your feet? Where have you washed the feet of someone else?